Tulalip, Microsoft's own Social Network - Will it stand!? Larry says Facebook is his second life. Mark vehemently convinces peers that Google+ is a better option. “If you need space, log on to MySpace”. This is an era of Social Communication and such networks help in making things pretty easy in the already ‘lazy’ lifestyle of individuals. Facebook is rolling out new updates every single day including the new sidebar chat feature while Google is constantly working on Google+ to make it an even better place. Talking of technology pioneers, i.e. Google, Facebook, did we miss a name or two? Yes, Microsoft! A first look at the homepage of the Tulalip project indicates that one can login via Facebook or Twitter, which affirms that some background talks between Microsoft and Facebook/Twitter have been held regarding this ‘internal design project’ from Microsoft Research. 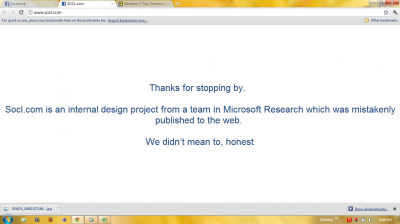 With the site down as soon as it was up, Microsoft played it smart. But the question that arises is, ‘Will the Tulalip Project (which is a codename) be made available to public?’ and if yes, then will it be able to stand along in this fierce competition of social networks revolving mainly Facebook and Google+? Or is there something left by Facebook and Google+ which Tulalip will pick up? Time and Softies will have the answers but as for now, we know that there is ‘something’ coming from Microsoft in the social network genre. At this point we don’t even know if it’ll be a social network or not. Notice the options to log in via your facebook or twitter account. That is simply not viable if it’ll be a competition to facebook. 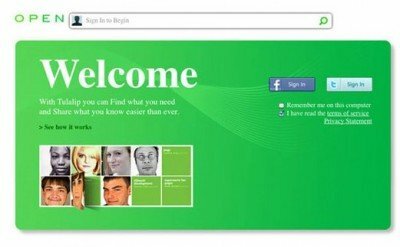 Microsoft has previously tested the Social Networking waters (remember MSN Spaces?) and failed. Personally, I don’t think it’ll venture there again. My guess is its just a connectivity hub for bringing all your social accounts together in one place, much like Tweetdeck.